The Minneapolis music scene has exploded over the last 35 years, and renowned photographer Daniel Corrigan has had the privilege of capturing some of the city’s most important and iconic music-related moments with his camera. 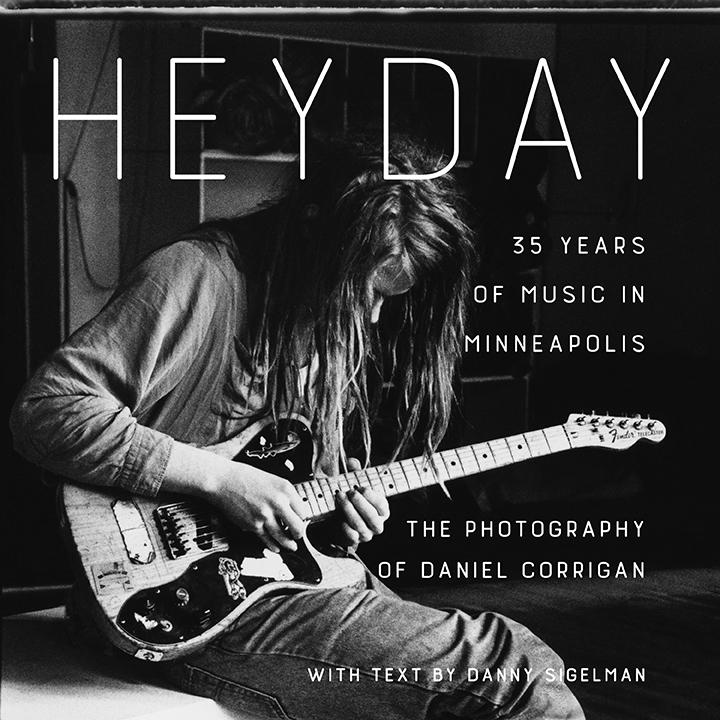 Now, with the help of his friend and journalist Danny Sigelman, Corrigan’s story unfolds in Heyday, a 10×10, 224-page coffee-table compilation that anyone interested in music or photography should pick up. Featuring nearly 500 photographs that span from 1981 to 2016, the book pulls from Corrigan’s extensive collection to share everything from one of his iconic classic photos of Prince to more contemporary shots of the Strokes and Amanda Palmer. From album covers he’s created to his decades-spanning Soul Asylum catalogue, the book features something for all music lovers. The development and construction of Corrigan’s printed opus required the laborious process of sifting through over three decades worth of black-and-white and color photos, many of which were taken before digital technology came about and, as a result, had to be found the old fashioned way—by digging through boxes. Not a small feat considering Corrigan has photographed thousands of concerts. Sigelman worked with editor Josh Leventhal, who acquired and curated the project for Minnesota Historical Society Press. Together, the pair went through approximately 10,000 of Corrigan’s photos, trying to put together the ultimate collection that would showcase both the photographer’s work and Minneapolis’ rich music history. In addition to working with Leventhal to select the collection’s final photographs, Sigelman wrote all the book’s text after completing several extensive interviews with Corrigan, which are featured throughout Heyday. “We did many hours of interviews,” Corrigan said. Sigelman elaborated on the interview process he used with Corrigan, which helped flesh out the collection’s stunning photography. “At a certain point we stopped looking at the pictures, and I would just try to really dig for his experience with certain artists, and bands, and we would have what I call therapy sessions where he’d come and sit on the couch and I’d kind of grill him about this stuff,” he said. Sigelman’s therapy sessions with Corrigan proved fruitful, as they helped dislodge memories the photographer had buried deep inside. Corrigan’s gift for storytelling has translated beyond his photography. An employee at First Avenue, he no longer makes the bulk of his income from photography. Instead, he now enjoys helping take care of the club and giving tours, allowing him to share stories from all the shows he’s attended and photographed. Heyday has been met with resounding success as Corrigan and Sigelman travel throughout the Twin Cities promoting the book with signings and other events. Among the upcoming events are a signing at the newly remodeled Barnes & Noble Galleria in Edina at 11:00 a.m. this Saturday, December 10, and one at 4:00 p.m. on Saturday, December 17, at Magers & Quinn in Minneapolis. In addition to author events, Heyday has a companion exhibit featured at Mill City Museum in Minneapolis through April 30, 2017. It’s a chance to see many of Corrigan’s photos blown up and on display in the museum’s central Mill Commons, which is free and open to the public.